Well… there goes June readers, and what a month it’s been! We’ve found out how to survive life as a zombie, we’ve been treated to another great photo from our number 1 fan, we’ve found out about the coolest kawaii crazes, and we’ve even had some help from a bona fide advertising genius! And, of course, along the way we’ve also met some truly amazing kawaii designers and shops. Strawberry Anarchy, Frozenfa, Chu Things and The Tiny Fig, to name but a few! Ah… June. Gone, but never forgotten! See you all again next month. What you’re looking at my fine kawaii friends are some of the truly spectacular t-shirt designs from the KawaiiPunk RedBubble shop - there’s even one with the Ed Mascot on it! But don’t let that put you off! 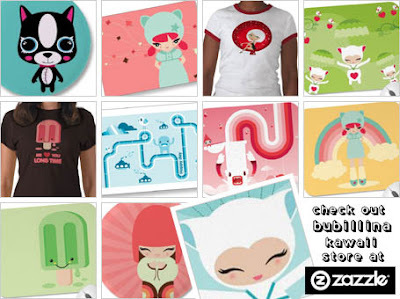 A lot of the tees at this KawaiiPunk store are exclusive to RedBubble, so be sure to check it out and start shopping! And remember to tell all your friends too! P.S. Don’t forget… send us a pic of yourself and your purchase and we’ll post it right here for all the world to see! How cool would that be? The Tiny Fig. Petite Perfection! To qualify for this offer simply enter the coupon code JUNESHIPFREE at the checkout and select standard (or economy if standard is not available) shipping. Offer valid until June 30, 2009 at 11:59pm PT. How lucky is that? 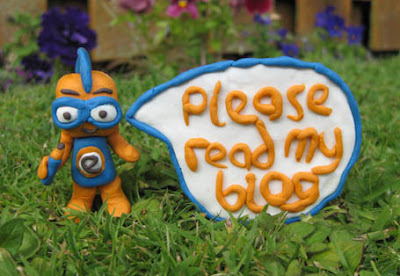 It’s a model of you looking all weedy and saying "Please read my blog." Pretty cool, huh? Twenty years out of the game and I’ve still got it! Hey Ken. Thanks for the support and your fantastic work of art. I think it captures my rugged good looks perfectly. As you can see Chu Things have some seriously cute designs and are more than happy to cater for kawaii astrologists like myself. 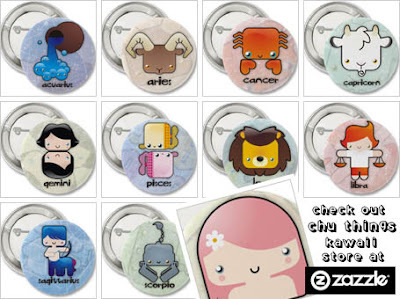 Just looking at these star sign buttons will make you wish you had 12 birthdays - they’re all so cute! Add the fact that Chu Things also have adorable t-shirts, cards, mugs, keyrings and more, and pretty soon you’ll be wishing you had a birthday every day! Actually… why not treat yourself, and pretend you do! I’m usually a very punctual person but last Thursday, after a spot of late night shopping, I found myself running late for the first time in 15 years! Having another appointment to keep, and not wanting to tarnish my exemplary time keeping record, I decided to take a shortcut home. The route I chose took me through an old abandoned funfair which, I believe I’m right in saying, was built on an ancient burial ground. Nothing unusual in that, I hear you say. Well… unfortunately, you’d be wrong! While enjoying my stroll through the shadowy decay of the long still carousels I became aware of a dishevelled figure in the distance shambling its way towards me. It was a tall, thin creature with wild hair that was mumbling incoherently. At first I thought it was that singer that the tabloids are always banging on about, but luckily it was only a zombie! Anyway, to cut an already too long story short, it bit me and now I’m a zombie too! I was hoping you could give me some advice about where I should go from here. 1. Stay social! Get out and meet other zombies. Graveyards and malls are good places to meet like minded monsters like yourself! 2. Vary you diet! Although brains are the staple food for zombies, acquiring them can be a troublesome process. Why not try sausages or burgers? Believe me, you won’t taste the difference! 3. Wear sensible shoes! Shuffling and staggering are the preferred modes of transport for zombies, so say goodbye to those heels! Sorry ladies! 4. Don’t be stinky! Not everyone likes the stench of rotting flesh so be sure to bathe regularly and often. This advice is also good for the living! Hey readers! If you like your kawaii with a happy face and humorous twist then you’re going to love what I’ve got for you today. 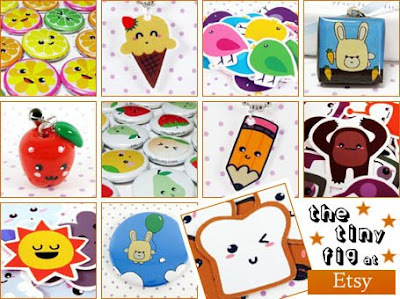 It’s a shop packed with cute characters, adorable animals, and bright designs. All brought to you with smiles aplenty! The shop’s called Frozenfa and, believe me, it’s got more kawaii style than a cupcake eating an ice cream! See what I mean! And it’s not just cute t-shirts they sell either. At the Frozenfa shop you can also pick up cards and prints – perfect if you’re shopping for a birthday present! In fact, perfect if you’re shopping for any occasion! Why not visit Frozenfa and check it out for yourselves? Enjoy! 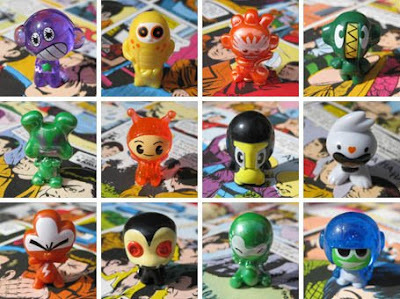 For those of you still in the dark about these cute characters Gogos are pocket sized toys and stickers that can be collected and traded. They usually come in packs of three and, at only 99p, are just perfect for the kawaii collector on a budget! You can also get a sticker album, a cool carrying bag, and even a limited edition tin if you feel like pushing the boat out! Perfect for kids and grown-ups alike! Hello readers, Money Mascot here – your friendly financial advisor and shamefully shameless self promoter! Today I’d like to introduce you all to a truly fabulous kawaii shop. 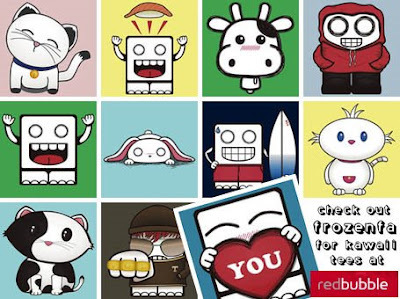 It’s got cute clothes, sweet stationery, cool cards, and best of all… it’s got me! It’s the KawaiiPunk shop at CafePress! What? You think Donald Trump got where he is without blowing his own trumpet? P.S. Send us a pic of yourself with your KawaiiPunk purchase and we’ll make you the envy of your friends by posting it here! Imagine that! Before I get to my point I would like to make it perfectly clear that I am fully aware of the irony of this correspondence. Having previously stated my intention to boycott KawaiiPunk (Re. Ghost Caught on Camera!) I take absolutely no pleasure in having to write to you again. Of that, I can assure you! 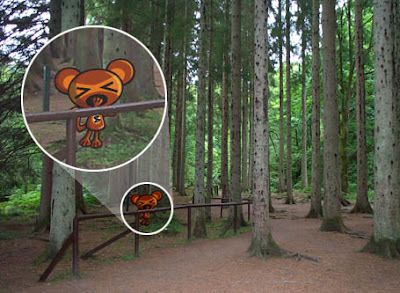 Anyway, after my recent and unpleasant experience involving that foolish Ghost Mascot, I decided to take a trekking break in the beautiful woodlands surrounding the picturesque Scottish town of Aberfoyle. A perfect way to recover from my traumatizing ordeal! Or so I thought! Throughout my walk I was aware of a soft yet annoyingly audible drone. It sounded like snoring. I told myself I was just hearing things and tried to enjoy the day as best I could. Unfortunately this didn’t work. Now, I’m not usually one to state the obvious, but… to say I was upset by this lethargic layabout’s intrusion would be something of an understatement! In fact, I was so upset I nearly blew my moustache off! To make matters worse, closer inspection of the photograph revealed that this ignoramus of a Mascot wasn’t even sticking to the designated pathway! Unbelievable! Rest assured I have reported this reckless behaviour, with photographic evidence, to the appropriate authorities. Expect to hear from them soon! Strawberry Anarchy in the U.K. Pretty cool, isn’t it? And don’t think that’s all you can buy from this store! 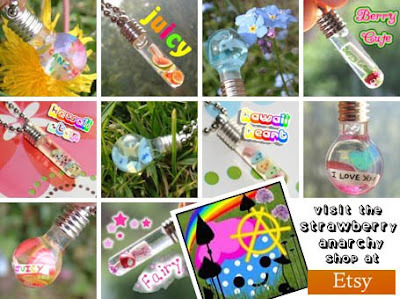 As well as the snowglobe necklaces and charms featured here, Strawberry Anarchy also sells toy car bracelets, doll shoe earrings, magical crystal wands, and even a fairy house brooch! It’s as if Alice left Wonderland and started running a shop! Why not head on over and find some cute summer sparkle for yourself? A chance meeting with an old school friend will lead to an awkward and boring conversation. Just cross the road! Now’s a good time to buy a hat if you’ve been thinking about buying a hat. Otherwise, don’t bother! Romance is thick in the air this month, though sadly not for you! Prepare for heartbreak and disappointment. An unfortunate incident with a monkey will see your favourite top ruined. Avoid zoos, unless you like being laughed at! Absolute accuracy is the key to surviving this month. Measure twice and cut once if you want to succeed. An opportunity to make a fortune will present itself to you. If it arrives by email, forget it! Trust me! An innocent suggestion will lead to embarrassment on an unparalleled scale. Tread carefully to avoid misunderstandings. A moment of indecision will lead to a lifetime of regret. Say yes to everything this month, or possibly no. An uninvited guest will ruin a perfectly good night in. Don’t answer the door and you should be fine. An encounter with a clown will have life changing consequences. They won’t be good. Cancel that circus trip now! Good news! You’ll remember that important thing you’ve forgotten. Bad news! It turns out it’s not that important after all. Absolutely nothing interesting or eventful will happen to you this month. But never mind, things might pick up in July!